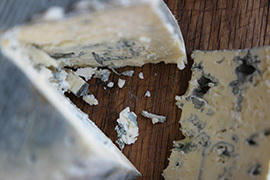 Shepherd’s Store is a traditional, European style semi-hard cheese. 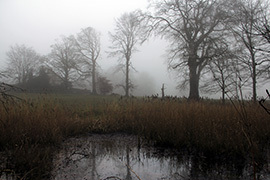 As a seasonal product, it is made only between the months of February and September, and is aged for a minimum of six months. 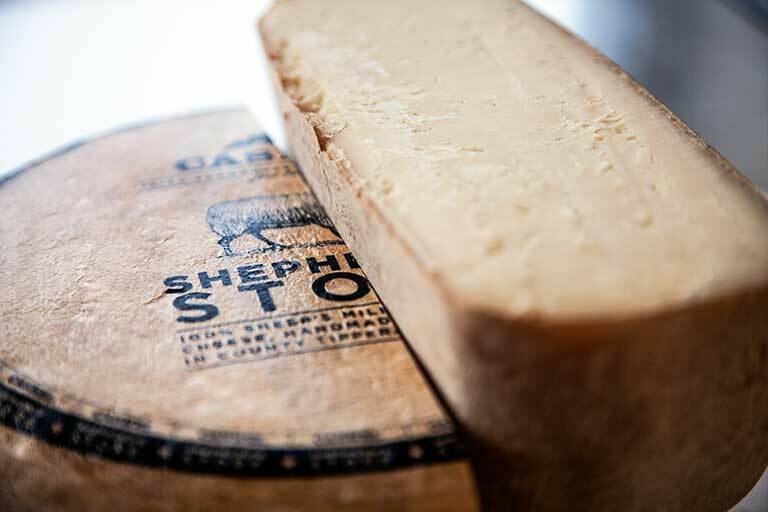 Shepherd’s Store offers a firm yet delicately creamy texture – with a full yet not strong flavour – combining a complex mix of both savoury and gentle, sweet notes. 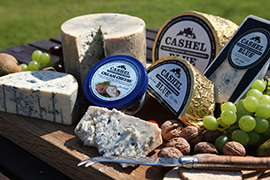 Creamier in style than Manchego or Pecorino, this is a distinctly Irish traditional farmhouse cheese. 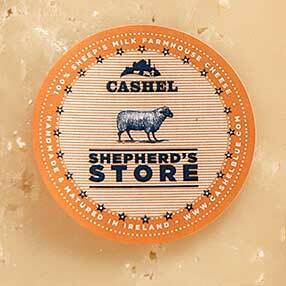 Shepherd’s Store is handmade from 100% local Irish Friesland sheep’s milk. Each wheel weighs as much as 5 kilos and represents approximately 50 litres of milk. Just imagine – it takes 30 sheep one day to produce enough milk to make a single wheel of cheese (as sheep only produce at best 2 litres per day)! This is one of the reasons why Shepherd’s Store is just so rich and delicious. 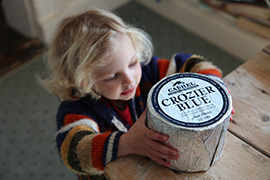 Another reason is the love and care that we put in after the cheese has been made. 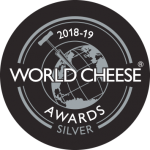 While maturing Shepherd’s Store, we wash and turn each cheese by hand once a week for 6 months, until it reaches a balanced flavour and is ready for you to enjoy. 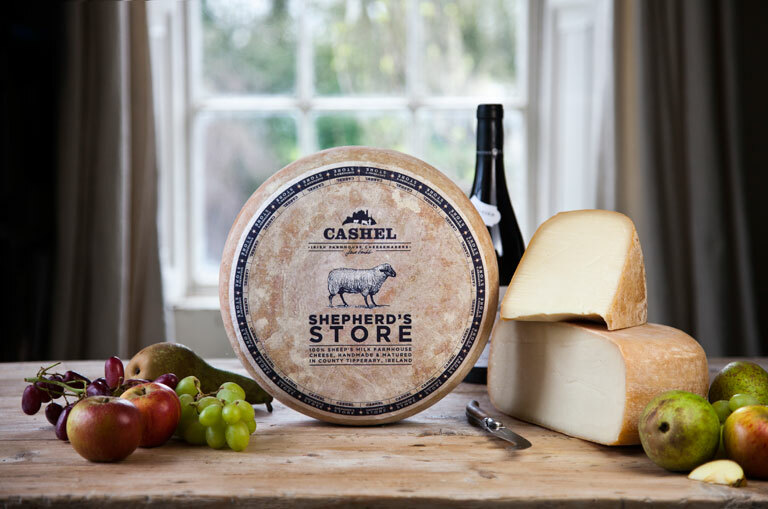 Shepherd’s Store is ideal as a cheeseboard cheese, but can equally add another dimension to a green salad with toasted pine nuts, ripe tomatoes and prosciutto. Order Shepherd’s Store in our Online Shop! Order a piece here with Free Delivery anywhere in Ireland / Northern Ireland! Pasteurised sheep’s whole MILK; salt, rennet, microbial cultures.